“The Islamists are taking revenge on us Christians!” These words were the commentary of Coptic-Catholic Bishop of Assiut, Kyrillos William Samaan, with regard to the latest Islamist attacks on Christians and Christian institutions in Egypt while in conversation on Monday (August 12) with the international Catholic pastoral charity “Aid to the Church in Need” (ACN). 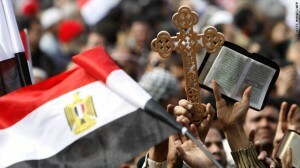 The Bishop stressed, however, that the climate had changed considerably for Egypt’s Christians since the fall of Mursi. “We feel at home again in Egypt,” Kyrillos explained. He went on to emphasize that non-Christian publicists would now speak up for Christians by stressing that Christians should not be expected to pay the price of democratization. The Bishop also saw it as a positive sign that in Sohag or Assiut, for example, moderate Muslims had defended Christian churches against demonstrating Islamists. “This is the true Egypt: Christians and Muslims are united,” Bishop Kyrillos continued. According to him, this year’s message from Pope Francis at the end of the Islamic fast of Ramadan was received very positively. For the first time the Pope had used the opportunity to address Muslims worldwide personally. In previous years the letter had been published by the Pontifical Council for Interreligious Dialogue on the Pope’s behalf. The Coptic-Orthodox Patriarch Tawadros II, the head of the largest Church in Egypt, made a plea on Monday for the avoidance of further bloodshed in the face of denominational tensions. According to media reports the Patriarch has suspended the weekly audiences in his Cairo cathedral for fear of attacks. Previously 16 Egyptian human rights groups had accused the Islamists of stirring up feelings against Egypt’s Christians since June 30, the day of the mass protests against Mursi. At the same time they criticized the state for not doing enough to protect Christian institutions and individuals.